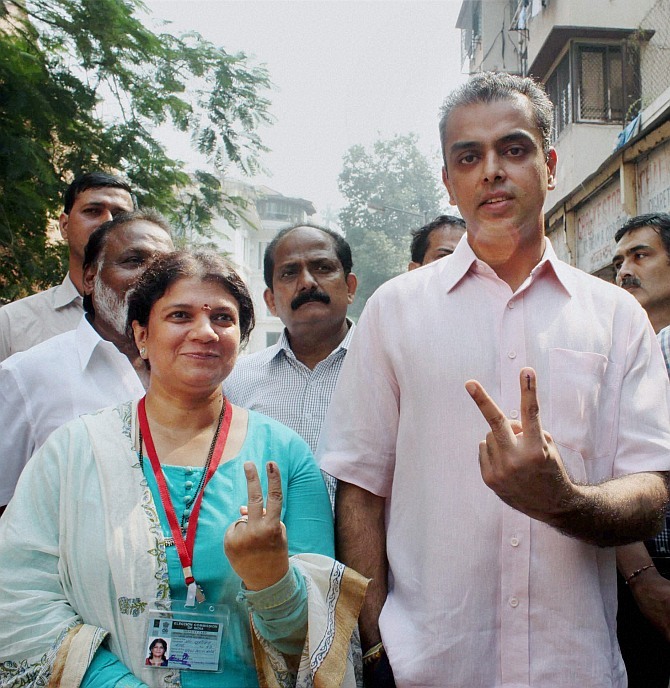 Voting day in Maharashtra and Haryana saw its top netas and celebrities come out and vote. 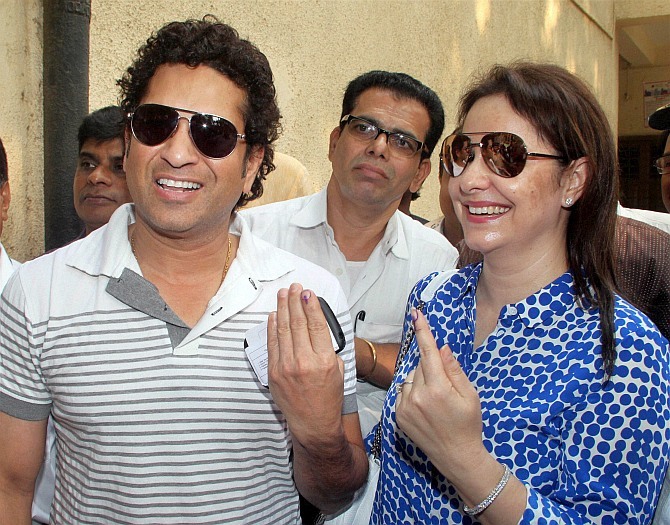 Legendary batsman and Rajya Sabha MP Sachin Tendulkar with his wife Anjali at Bandra, Mumbai. Photograph: PTI Photo. 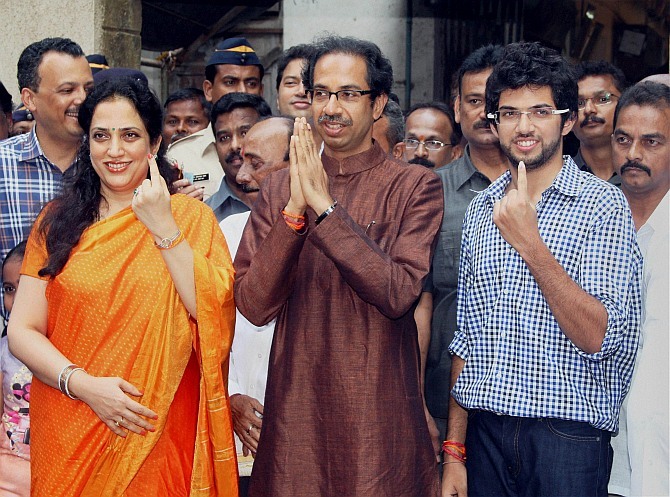 Shiv Sena chief Uddhav Thackeray and his family show their ink-stained finger at a polling booth in Mumbai. Photograph: PTI Photo. 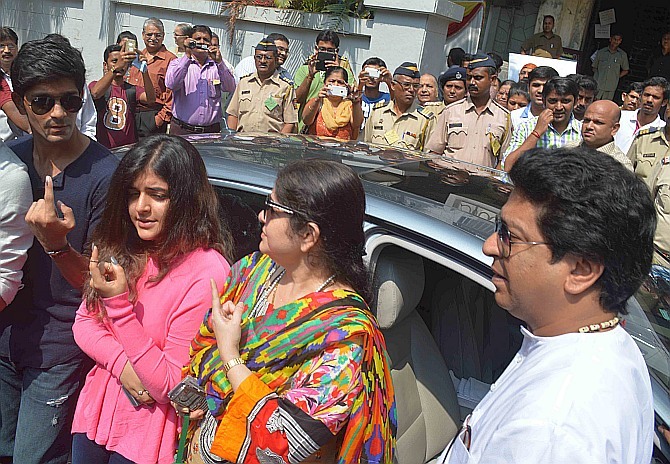 Maharashtra Navnirman Sena chief Raj Thackeray with his family at a polling booth in Mumbai. Photograph: Sahil Salvi. This may just go on to become the selife of the day. 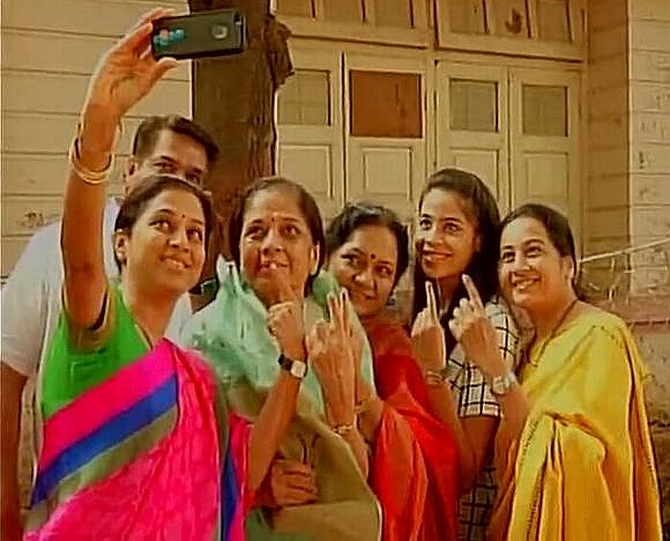 Nationalist Congress Party's Supriya Sule takes a picture after voting in Baramati on Wednesday. "I appeal to the people to cast their votes for a stable government, a single vote can also bring change," Sule said. 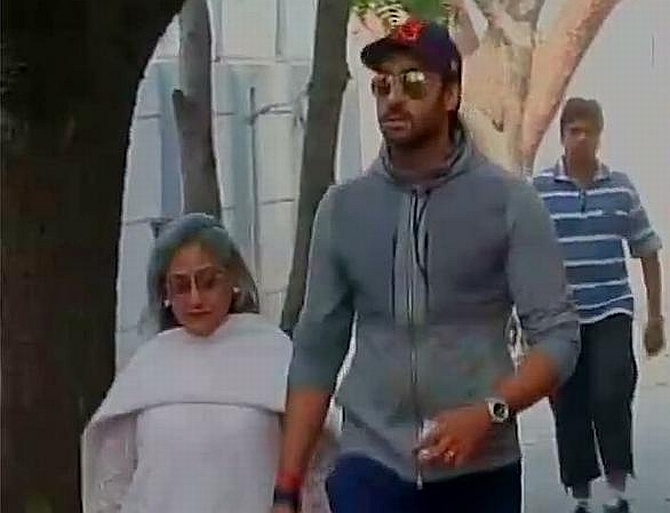 Actor Abhishek Bachchan along with mother Jaya heads to a polling booth in Juhu, suburban Mumbai to cast his vote. "I request my fellow citizens to come out and cast their votes, this is our right and duty: If you want change in the society, come out and cast your vote," said Abhishek after casting his ballot. What about wifey Aishwarya and daddy Amitabh, we wonder. 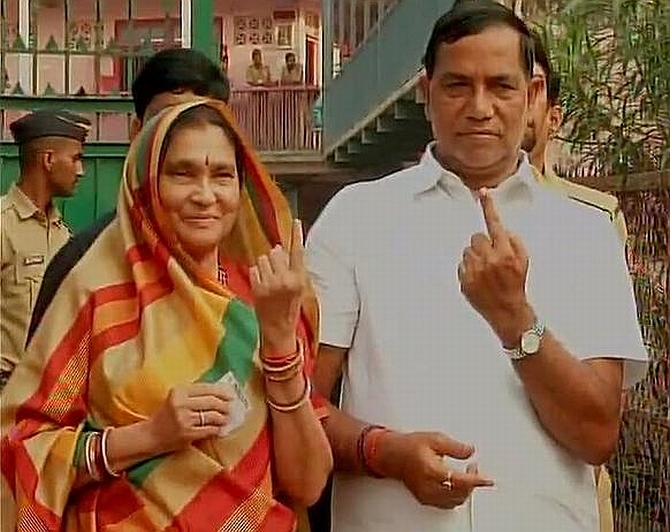 Maharashtra 'Mr Clean' Devendra Fadnavis shows his inked finger after voting in Nagpur. Currently, the state president, Fadnavis may go on to become the state's chief minister if the BJP wave continues. 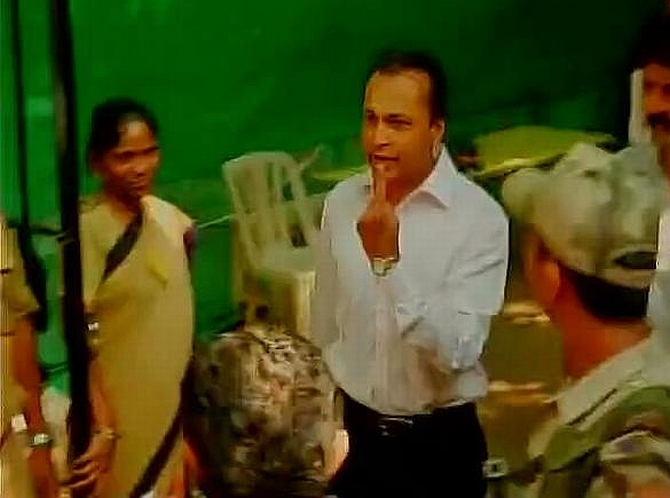 Congress MLA Kripashankar Singh casts his vote in Mumbai. A three-time MLA from Kalina, Singh defeated Chandrakant More of MNS by about 13,000 votes. 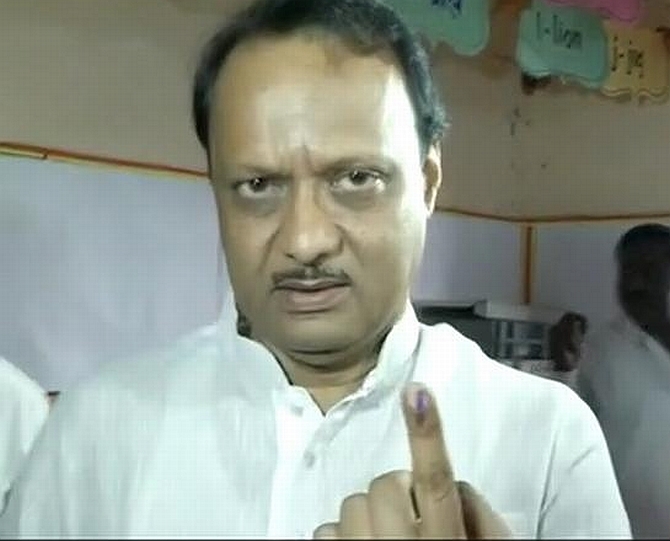 Former Maharashtra deputy and NCP strongman Ajit Pawar was among the early voters in Baramati, the pocket borough of Pawars in the Pune district. 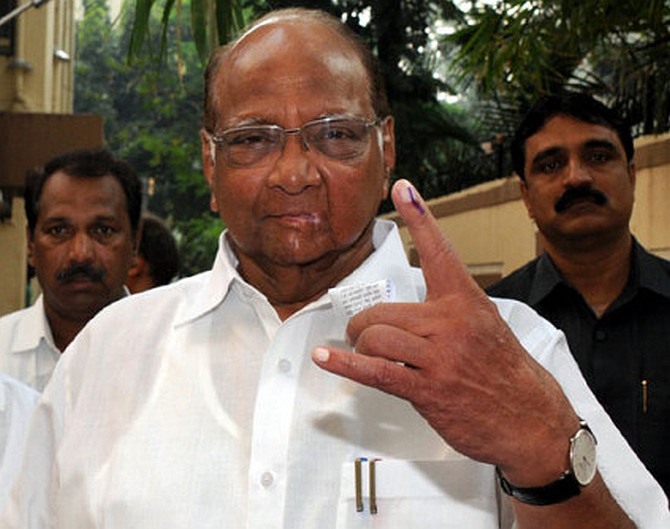 Ajit, the nephew of NCP chief Sharad Pawar, is seeking a sixth term to the assembly on his home turf. He has won all the assembly elections from here since 1991. Among the early voters in Mumbai was yesteryear star Rekha. The actress cast her vote in suburban Bandra, home to a number of Bollywood celebrities. 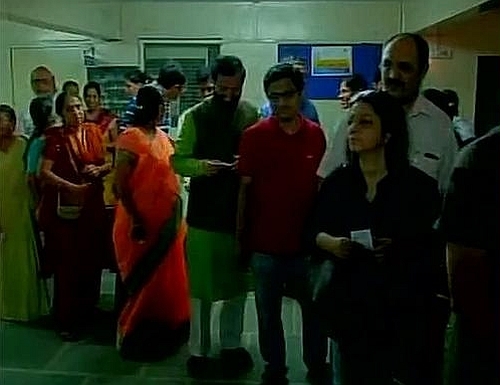 Information and Broadcasting Minister Prakash Javdekar stands in queue to vote in Pune. "People have voted with even more enthusiasm than Lok Sabha. If LS polls were Dhoom, assembly polls are Dhoom 2," he said. 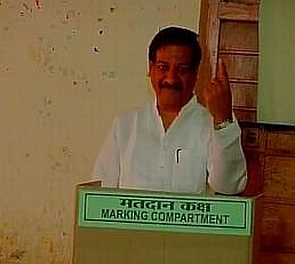 Former Maharashtra Chief Minister Prithviraj Chavan votes in Karad from where he is the candidate. 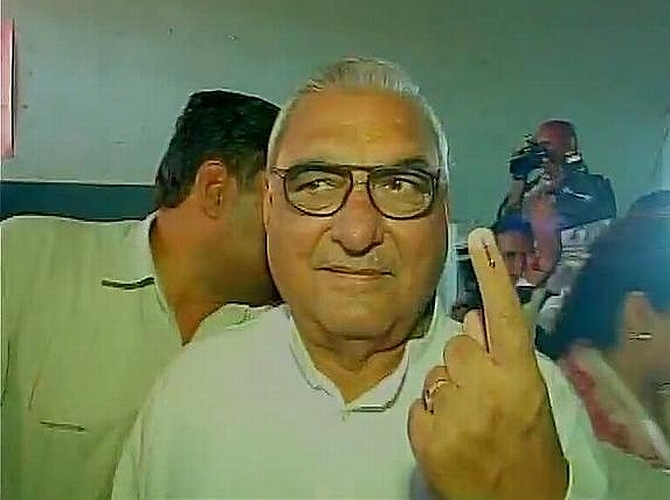 Haryana Chief Minister shows his inked finger after voting casting in Sangi (Rohtak). A relaxed Hooda was seen playing badminton on Wednesday morning even as he fights for a third term. "I am very confident the Congress will form government for the third time," he said. "All BJP candidates are the ones who left the Congress." "We got the right to vote after long freedom struggle, people must cast their votes," he added. Will Maharashtra see the end of the coalition era?